I felt happy the minute I saw the first rectangle of hand-painted plywood promising “Ruston peaches ahead” in Pass Christian, Mississippi. To my left, the Gulf of Mexico stretched toward an endless horizon, shrouded in a summer haze. To my right, the bleached Mississippi landscape whispered of the things it has seen. 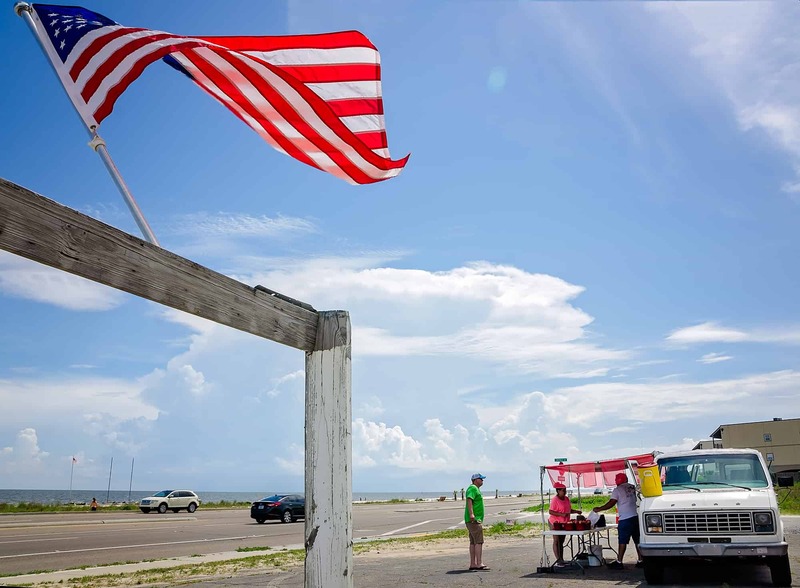 More than a decade has passed since Hurricane Katrina obliterated nearly everything south of the railroad tracks, from Biloxi to Waveland, Mississippi, but the storm’s calling card remains. It can be a sad drive, remembering what was. But on this particular day, I was looking for hope. I found it in the Pass. 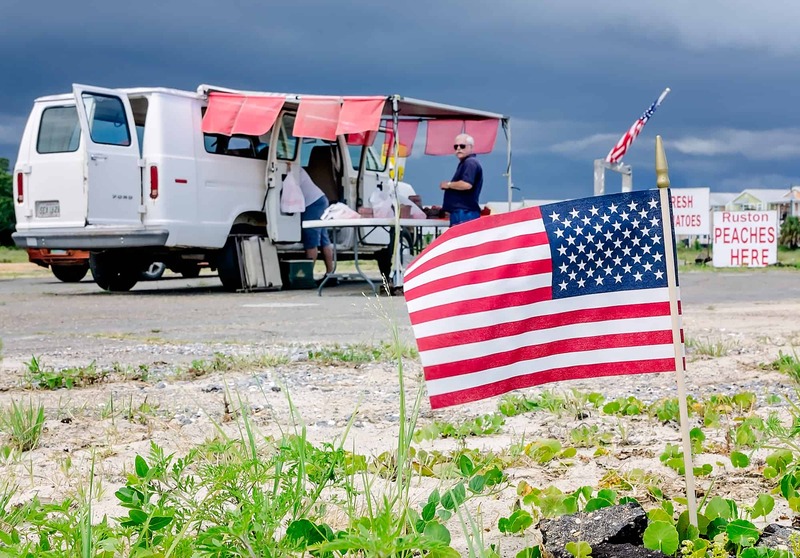 There on the cracked asphalt of an abanded lot, Louisiana native Paul Verzwyvelt peddles peaches, politesse, and patriotic pride from the doorway of his battered white van. His red awning goes up on Memorial Day and is gone by sundown on Labor Day. 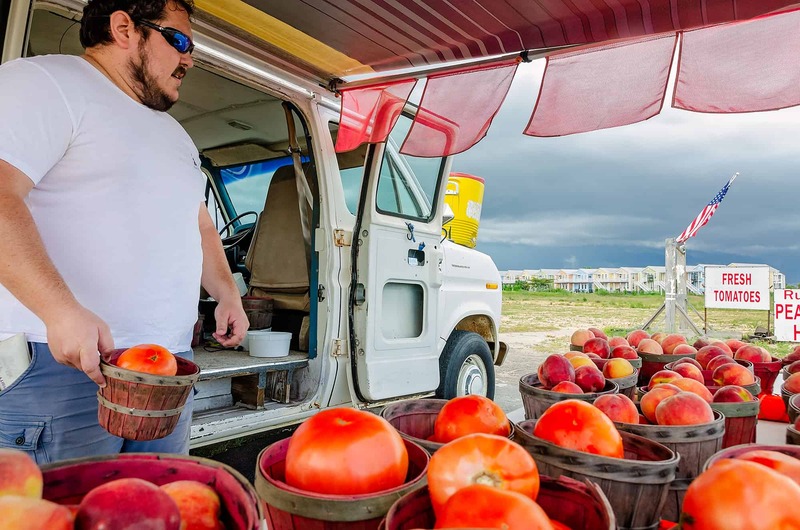 He sells white and yellow peaches and softball-sized tomatoes grown on his uncle’s farm in Calhoun County, Louisiana. 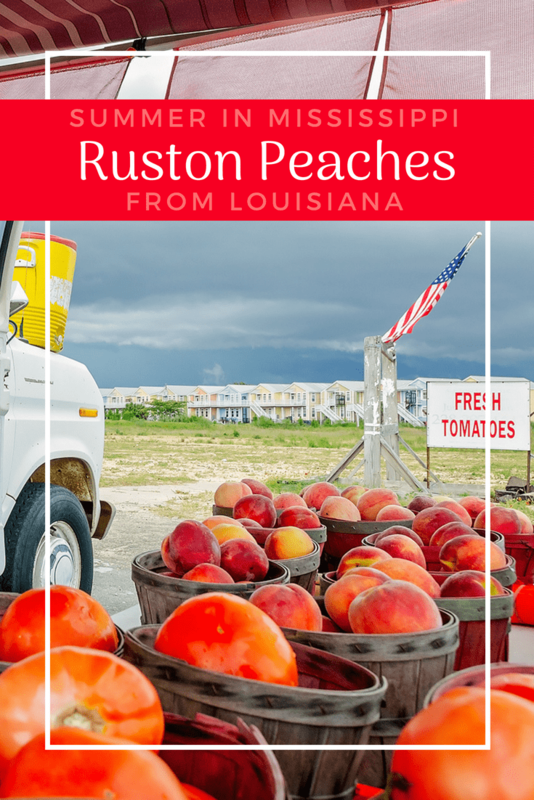 Northern Louisiana is so well-known for these peaches that people arrive by the carload to buy them, and the city of Ruston, Louisiana celebrates their sweetness every summer at the Louisiana Peach Festival, which begins today. A basket of them was even presented to Richard Nixon in Washington, D.C. when he was vice president. 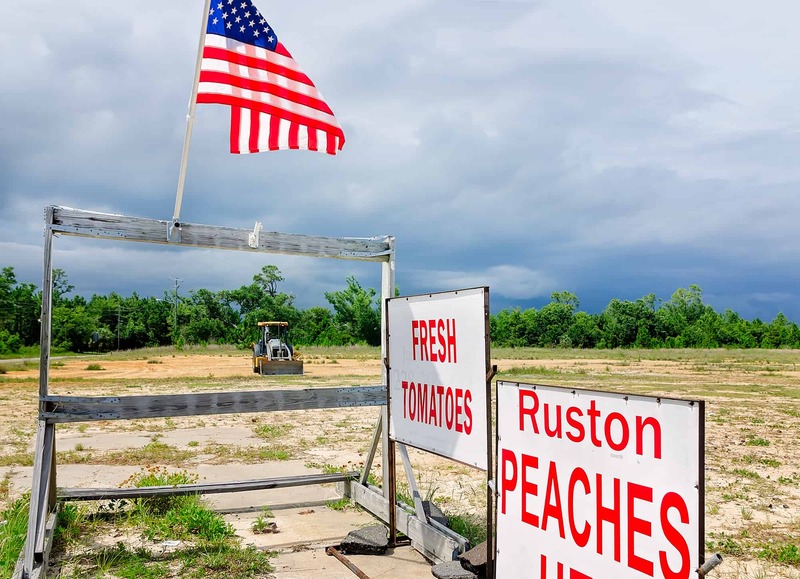 Verzwyvelt’s wooden signs and American flags catch the eye, but the Ruston peaches sell themselves. I was on assignment, so I hung around for a while, chit-chatting with Verzwyvelt and his customers. It was, quite possibly, the happiest place you could be in Mississippi at 3 p.m. on a Tuesday afternoon, as the June sun baked oil-slicked vacationers and time unfurled languidly toward the work day’s end. 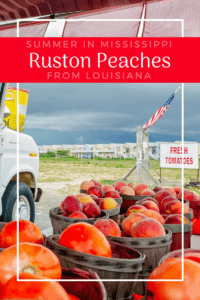 I learned that yellow Ruston peaches are the most popular, praised for their intense “peachiness,” but white peaches are firmer, sweeter, and less acidic. I learned that Celebrity tomatoes are extraordinarily disease-resistant and can thrive anywhere, from Canada to Florida. And I was reminded that in a world where politics divides and technology distances, there remains one universal when summer rolls around, thoughts stray to simpler pleasures. It doesn’t get much simpler – or much better – than a thick tomato and mayonnaise sandwich on white bread, followed by a juicy peach still warm from the sun. Note: Set your GPS for Gulf Palm Villas, 1453 East Beach Blvd., Pass Christian. If you’re coming from the east, the fruit stand will be on your right, just before you reach Gulf Palm. 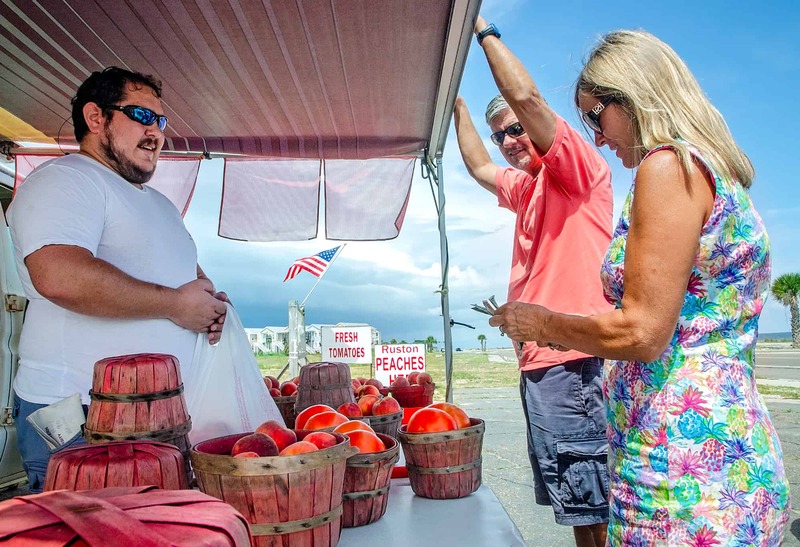 If you’re coming from the west, the fruit stand will be on your left, just after you pass Gulf Palm. Admission is free on Friday from noon to 5 p.m. Admission is $10 Friday night and all day Saturday. Weekend passes are available for $15. Admission is free for children eight and younger. Call 318-255-2031 for more information.